Champagne, Fruit and Gourmet Fruit Basket. This supreme fruit basket is highlighted by a bottle of champagne. 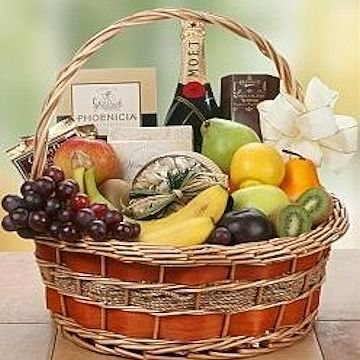 The basket is generously filled with fresh fruits and gourmet items such as: crisp apples, juicy oranges, bananas, kiwi, gourmet cheese, crackers, summer sausage, and candies. Exact basket and fruit selection may vary by season and delivery location. Champagne Fruit Gourmet has been purchased most frequently by our customers for the following occasions: Congratulations, Birthday, Christmas, Thank You, and Anniversary.